The holidays are a time for imbibing in lots of great food and drink. 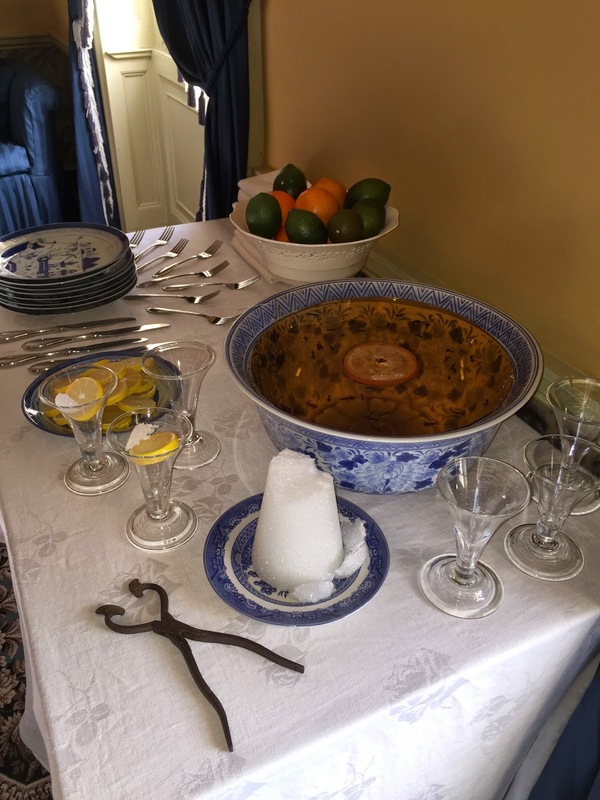 In fact, a large punch bowl always at the ready was a sign of hospitality in colonial Virginia. Based on the number of recipes for special occasion punches found in some early 20th century Maryland cookbooks, the penchant for holiday punches was clearly popular in more northern regions, as well. According to the Merriam Webster Dictionary, the word Punch most likely comes from the Hindustani, Sanskrit or Greek words for five in regards to the five main ingredients of punch: rum (or any spirit), water, sugar, citrus and spices. Also, the use of this word may go as far back in time as 1632. Interestingly, when the citrus and spices, the two most expensive ingredients, are not included in the drink, it is then called a Toddy. Though never really popular in America, the English tradition of "wassailing" the apple orchards on Twelfth Night is most likely the origins of the holiday bowl of mulled cider or wine. "Waes Hael" means Good Health and also refers to the drink of mulled spiced cider and/or ale that was used to sing and toast apple trees, with the intent of promoting a good harvest in the new year. Combine ingredients and bring to a slow boil. Simmer 10 minutes. Strain and serve hot. 4 cups apple brandy may be added after boiling, if desired. Grate half a nutmeg in a pint of wine & sweeten to your taste with loaf sugar, set it over the fire & when it boils take it off to cool, beat the yolks of 4 eggs exceeding well, add to them a little cold wine, then mix them carefully with your hot wine, a little at a time, then pour it backwards & forwards several times ‘till it is quite hot, and pretty thick – serve it in chocolate cups, with thin pieces of toasted bread. Howard, Mrs. B.C. Fifty Years in a Maryland Kitchen. New York: M. Barrows and Company, Inc., 1944. Mash and bruise the cinnamon, nutmeg and cloves together in an enamel or glass pan, add the boiling water and let them stand for one hour. Strain and add the sugar to the liquid. Heat the wine in the upper part of a double boiler and add the spiced water to it. Serve hot in mugs. Six cups. Mix the ingredients and sweeten to taste. Add the cracked ice and serve in tall glasses. Serves ten to fifteen. If a hot cup is liked for a cold winter's night, add three pints of hot water instead of the ice and sparkling water called for. Add one cinnamon stick to each mug and a slice or two of lemon. This treat which is quite traditional in America probably started out as a posset, a sack posset, or an egg caudle. A posset is a slightly curdled drink made of hot milk mixed with sugar, spices, citrus and beer, sherry, or wine. A sack posset is made with sweet white wine, like sherry. Possets became popular in the Middle Ages, and by the 17th century, eggs started to be added to possets. These were sometimes called egg-caudles. The first written reference to egg-nog was from its mention on a breakfast menu at City Tavern in Philadelphia, February, 1796. It was considered a hot winter treat and may be why it is so much associated with Christmas today. Beat the yolks till light, combine with the stiffly beaten whites and mix the sugar with this. Pour slowly into these the two brandies, then add the whipped cream which has been mixed with the milk. Sprinkle grated nutmeg over the bowl's top. Fifty punch glasses. To make four gallons of Egg Nog, two gallons of cream, one gallon & one quart of new milk, two lb. lump sugar, three pints of French Brandy, half-pint Peach Brandy, thirty-three eggs. Pound the sugar & beat it with the eggs very light, then stir in the Brandy slowly on it till well mixed. Then the cream & milk, stirring all very well. There are, no doubt, a hundred and one receipts for Egg-Nog; most suffer from being too sweet or too rich. Egg-Nog has been served on New Year's Day in my family for at least four generations, and it has always been made in the same way, in the same bowl. It has been made to drink, not to taste ritually. The passing years seem to have confirmed the judgment of older generations. Our bowl is about 12" across the top and 8" deep, and this will about half fill it: 3/4 pint of the best Jamaica Rum, 1 1/2 pints of the best Bourbon Whiskey, 2 quarts milk, yolks of 8 eggs, beaten; 1/3 cup granulated sugar. Stir these together in the bowl and float on top the whites of the eggs, beaten until stiff, sprinkle freshly grated nutmeg over the whole. Do not heat or chill it, do not compromise with the quality of liquors used, and do not use cream. Mix all of the above in the punch bowl; sweeten to taste. Let stand four or five hours to ripen. At serving time add two or three quarts of sparkling water. Fill the bowl with cracked ice or one large piece of ice. Fifty or more punch glasses. "Port, a popular wine in the 18th century, is mulled in the same manner as was customary in the old seaport of Annapolis." Dissolve sugar in 1 cup of boiling water. Combine this with the lemon juice and Port in a lined pot over an open fire. Add cinnamon stick and the rinds. Serve hot with a dusting of nutmeg. Davidson, Alan. The Penguin Companion to Food. 2002. Merriam-Webster Dictionary, Origin of Punch: "perhaps from Hindi & Urdu pā̃c five, from Sanskrit pañca;akin to Greek pente five; from its originally having five ingredients — more at five; First Known Use: 1632"
Theobald, Mary Miley and Libbey Hodges Oliver. Four Centuries of Virginia Christmas. Richmond, VA:2000. 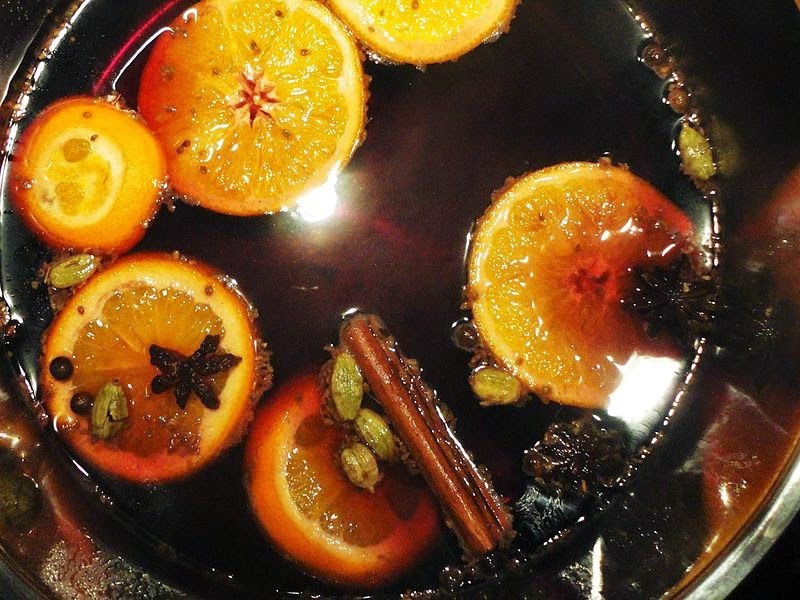 The last recipe for mulled wine sounds the best to me.